This reproduction of a U.S. m1912 mounted cavalry swivel holster for the Colt 1911 service pistol features quality leather in either black or brown, brass fittings, and the manufacturers original embossment. 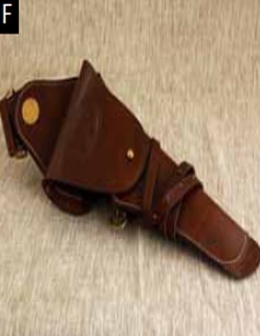 U.S. m1912 mounted cavalry swivel holster for the Colt 1911 service pistol. Copied from an original in the IMA collection. This page was last modified on 12 September 2014, at 11:05.